Looking for digital photography tutorials? The digital photography instruction on these pages are like having a photography expert at your side, helping you take better photos! Click to see what other visitors have submitted to the site. It will help you learn what works and what doesn't work. Got a little more time? Browse through the archives and get even more ideas on how to take better photos. Every snapper can produce top notch photographs. It doesn't matter how much your camera costs, or how large it is. 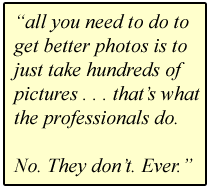 And don't believe anyone who tells you "all you need to do to get better photos is to just take hundreds of pictures. Some of them will be OK. That's what the professionals do." This whole site grew out of this philosophy. If you are looking for some digital photography instruction and want to take better photos - you have come to the right place! As a quick example of the difference a bit of simple digital photography instruction makes, look at the photo below. 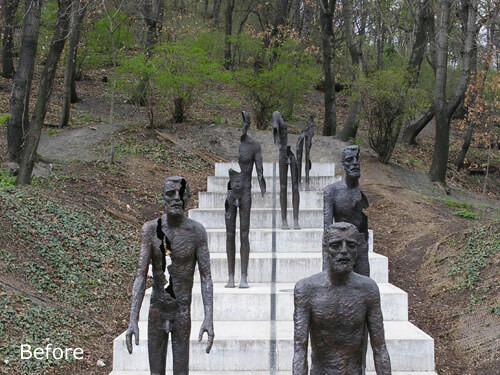 It's a piece of art-work in Prague. Roll your mouse over it to see the "before" and "after". The camera was the same. The time of day was the same. The subject was the same. The difference? The photographer! My wife (love her to bits!) took the "before" picture. "Thought we could make some post cards with it" she said. Then I had a look at it on the camera screen and didn't think we were doing the art-work the justice it deserved. So, I just re-framed the photo and the "after" is the result. This is not difficult to achieve! And it is really easy to learn - you just need some simple tips and tricks to help you out. 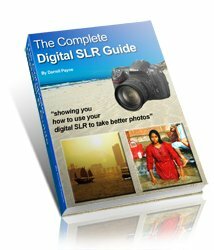 The links below will take you to pages that cover more specific digital photography instruction. Tips and tricks that I guarantee will improve your photography! No need to try them all at once. Take your time, try one or two now, get the hang of them, and then pop back to continue learning how to improve your photography skills. Have a photo you would like us to "critique"? Do you have a photo that you would like to offer up to be critique-d? Share your photo; tell us a little about it (how you took it, effects you were looking for, that sort of thing) and "Ed", and others, can offer suggestions as to how it might be improved. It's a great way for everyone to learn how to take better photos! Black and White Rose by Sheba. Morning on the River Soane by Sally. Bumblebee in the Marigolds by Laurie. Below are the digital photography tutor archives, along with Ed's comments. Grab a cup of coffee, and have a browse through them to learn even more ways to improve your photography!